While the attention of most equine enthusiasts was turned to Hong Kong for the equestrian events of the 2008 Beijing Summer Olympic Games, preparations were well under way for the next major international equine competition: the 2010 Alltech FEI World Equestrian Games (WEG). The World Equestrian Games are the championships of the eight equestrian disciplines recognized by the Fédération Equestre Internationale (FEI) and are held every four years. The 2010 Games at the Kentucky Horse Park mark the first time the event will be held outside of Europe, and it's also the first Games to include all eight disciplines at a single site. With just two years to go, many of the plans to keep both the competing and local horses healthy are in their final stages. Kent Allen, DVM, is serving as WEG's veterinary coordinator. Allen brings years of experience to the job, having served as the team veterinarian for the U.S. Equestrian Team and as vice-chairman of the FEI Veterinary Committee. Allen was the veterinary coordinator for the 1996 Atlanta Olympic Games and was the foreign veterinary delegate for the 2000 Sydney Olympic Games. 36 countries (Federations) have filed their list of nominated entries, which is a 'long' list of riders and horses selected based upon eligibility and preference. The final competition squads which will travel to Malaysia for the 2008 FEI World Endurance Championship will be selected (by their respective countries) from the nominated entry list with a maximum of 6 squad members per country. Malaysia, as the host nation, will be allowed to field a squad of 12 riders. 36 countries in total have submitted Nominated Entry Lists. 24 countries are participating with a Team (3 or more entries). 12 countries are participating with Individuals. The maxium riders participating will be 150. AT 6.30am with the temperature at 9 degrees and a stiff breeze blowing, 11 resilient riders and their hardy camels set off in the inaugural Australian camel endurance race, the Sheikh Zayed Camel Endurance Race. The 120km race was run over two days around a 7km circuit on the banks and in the bed of the Flinders River, Hughenden. John Richardson, Emerald took the major prize just 12 minutes ahead of his nephew, Rowan Richardson, with veteran camel trainer Glenda Sutton, Darwin, taking third. The race carried prize money of $50,000 donated by Sheikh Khalifa Bin Zayed, ruler of Abu Dabbi and Sheikh of the United Arab Emirates (UAE). Named in honour of the founder of the UAE, the current sheikh’s father, it is the feature event of the Arid Lands Festival. It is not unusual that a western community like Hughenden would stage an Arid Lands Festival. What is unusual is that the idea came from the UAE. Organiser and president of the Arid Lands Festival committee, Paddy McHugh, said the idea was suggested to him by a vet who was working for Sheikh Zayed. The vet suggested that a festival in Australia incorporating a major camel endurance race may be a good idea. Mr McHugh had been on one of several trips to the UAE delivering Australian camels to that Arab state and on his return decided to pursue the idea. Sixteen months later the inaugural Arid Lands Endurance race for camels in Australia took off. KUANTAN, Aug 24 (Bernama) -- Yang di-Pertuan Agong Tuanku Mizan Zainal Abidin emerged champion at the Pahang-PENN 100km Endurance Challenge which ended at the Cherating here Sunday. Tuanku Mizan astride Magna Thor took 8 hours 17 minutes and 49 seconds to finish ahead of the other riders in the gruelling race. Asri Abd Aziz came in second in 8'17:55s while Datuk Mohd Shuaib Ishak was third in 8'21:14s. Shamsuddin Ab Roni won the 60km category in 4'42:51s with Yusnar Yusup (4'42:52s) and Mohd Azhar Ariffin (4'59:33s) were second and third respectively. In the 20km category, M. Syafiq Hakimi was first in 1'40:01s followed by Datuk Mokhtar Haron (1'40:02s) and Rosli Endut (1'40:03s). His Majesty's team, Royal Terengganu Endurance Stable also won the team category in the 100km endurance while Magna Thor was named the best horse. KUANTAN, Aug 23 (Bernama) -- Yang di-Pertuan Agong Tuanku Mizan Zainal Abidin together with 76 participants began the inaugural Pahang-Penn Endurance Challenge 2008 at Pantai Cherating near here this evening. Tuanku Mizan who represents the Royal Terengganu Endurance Stable (RTES) team is up against two other teams, Darul Iman Endurance Team (DIET) and Bunga Raya, in the 100km category race. The competition, in which each team has four members, is expected to take 12 hours and 30 minutes and Tuanku Mizan is expected to finish at 6am tomorrow. The 60km category is participated by six teams which are Ar-Raudah, Presco Endurance, PDRM C, Kiara A, Bunga Cempaka and Island Horses. Teams Kiara C, Kiara B, Kiara D, RTES, Presco Endurance, PDRM A and PDRM B are in the 20km category race. The 60km race is expected to take 10 hours and the 20km race three hours and 30 minutes. The competition is attended by about 1,000 spectators to watch the beginning of the races as well as to have an outing with their families. Massman says that her belief in CHF Addios never wavered. It was a cold Colorado morning, but the girl from Iowa knew it would warm up soon enough. What she didn't know that early morning were all the obstacles she and her horse were about to face during the nearly 11-hour 2008 North American Young Rider Endurance Ride. "There were a lot of things that went wrong along the way," Caitlin Massman said. "I just put my faith in God." The 17-year-old from Dubuque entered her first 75-mile endurance ride with her Arabian horse named CHF Addios late last month. It was the first time the duo dealt with the high altitude and terrain of Parker, Colo. While some doubted the small Arabian horse and his Midwest owner could handle the altitude, Massman's belief in CHF Addios never wavered. "He's a tough little horse," she said. "He's definitely one of the best." Massman and the nine other young riders began their horse endurance adventure at 5:45 a.m. The first of the five phases was a 12-mile loop the riders decided to ride together. It was during this phase that the riders made a dangerous discovery: Many of the area creeks were dried up. The lack of water would become one of Massman and CHF Addios' biggest obstacles. "I did the best I could, and Addios did, too," she said. After each of the five phases, which alternated between 12- and 19-mile loops, the horses were required to have a veterinarian check and the riders were required to rest for anywhere between 30 minutes and an hour. "It's almost like he knows and he just calms himself down," Massman said of her horse during the vet checks. It was while on the "really long loop" of the second phase that Massman was forced to make a difficult decision. She said the electrolytes for her horse, sort of like Gatorade for horses, were in a bag around her lap. Sometime during that second phase, the contents of the bag began to leak all over Massman's lap. When the burning sensation of the electrolytes became too much to handle, Massman told the two riders near her that she had to stop. As Massman dismounted her horse to hurriedly give him the remaining electrolytes, the other riders also stopped, waiting for Massman to compose herself despite the competitive nature of the race. "You know when to be competitive and when to not," Massman explained. By the fourth phase, the horse began to get bored, and Massman began to become dehydrated. She said she could feel her legs cramp up as she entered the vet check again. "I got there and put on a smile for the judges," Massman said. "I could kind of feel myself out of it." Someone noticed Massman seemed dehydrated and told the rider to dunk her head in a large tank of water before the final phase of the long, hot ride. For the final phase, the 12-mile loop the riders started with, Massman rode alongside Jessica DiCamillo. "It was so hot and our horses were so thirsty," Massman said, adding that DiCamillo's horse named Crestwind Premiere seemed to energize her horse. As they neared the end of the race, Massman did something that might shock others. "I pulled up beside her and asked if she was ready to go," Massman said. "It was just kind of fair game to say when the race started. If I wouldn't have asked, she would have asked." So the two girls and their horses raced for the finish line. "He was running his little heart out," Massman said. "He gave me everything that he had in him and I gave him everything that I had in me." Although she was in the lead for most of the ride, Massman ended up in a close second place. DiCamillo won first when she checked in at four hours, 23 minutes and 30 seconds, just two seconds ahead of Massman. "We tried our very hardest," Massman said. Her dedication and love for CHF Addios took her mother, Holly Massman, by surprise. "Her ambition and her perseverance is quite amazing," Holly said. "I don't know if I could have the stamina to start something like that." The race brought horse and rider recognition from enthusiasts. CHF Addios, which Massman bought for $700 at a barn sale, is now worth well over $7,000. "He's one of the toughest horses I know," Caitlin Massman said. "I'm going to keep him. I'm going to keep racing him." His Highness Shaikh Mohammad Bin Rashid Al Maktoum, Vice-President and Prime Minister of the UAE and Ruler of Dubai, won the 16km Austin Park endurance ride in the UK on Friday as the UAE team qualified for the 2008 FEI World Endurance Championships to be held in Terengganu, Malaysia, from November 6 to 9. London: His Highness Shaikh Mohammad Bin Rashid Al Maktoum, Vice-President and Prime Minister of the UAE and Ruler of Dubai, yesterday won the Austin Park endurance ride in the UK. Top French, Italian, Australian, Irish, British Irish and UAE horsemen took part in the 160 kilometre event which was a qualifier for the FEI World Endurance Championship that will be held in Terengganu, Malaysia from November 6-9. Shaikh Mohammad, along with Shaikh Hamdan Bin Mohammad Bin Rashid Al Maktoum, Crown Prince of Dubai, and Shaikh Majid Bin Mohammad Bin Rashid Al Maktoum, Chairman of the Dubai Arts and Culture Authority, all qualified for the World Championships. The UAE will be represented at the event by six riders, four of which will take part in team event and two the individual event. It will offer competitors and visitors the best of Malaysia's natural beauty. First class stabling and quarantine facilities are expected to be available for horses. The course is designed to provide a safe yet challenging competition, taking riders along the stunning coast line, through palm plantations, along canal banks and through natural vegetation forests. A long and wide grassy stretch of track provides ample space for the start of the competition and egress from the venue, and for a safe finish line and entry back into the Endurance Park. KUANTAN: Pahang will host the National-level Penn-Endurance challenge, a hard-core discipline of the horse-riding competition for a 100km, 60km and 20km distance in continuous hours in the Penn-Endurance Challenge 2008 in Cherating this weekend. State Youth, Sports and Culture Committee chairman Datuk Wan Adnan Wan Mamat said the King, Tuanku Mizan Zainal Abidin Sultan Mahmud Al-Muktafi Billah Shah would take part in the 100km race. Wan Adnan said he himself would take part in the 20km race as his first attempt in the event. He said Youth and Sports Minister Datuk Ismail Sabri Yaakob would flag-off the participants in the 100km and 60km race while Pa­hang Menteri Besar would start the 20km race. “The race will start in Kampong Cherating, at 3pm on Aug 23, near the Holiday Villa resort, and it will cover the route until Kuantan Port, back to Kampong Sungai Ular, Kampong Baging, all in Cherating area. “Participants are expected to reach the ending point in Cherating at 6pm the next day. “The race covers areas of beaches, river, forest and some hilly parts in Cherating.” said Wan Adnan. He said the event was offering RM10,000 cash and a challenge trophy for the champion in the 100km race, RM7,000 for the first runner-up while the prizes for other categories would be announced by the organising committee soon. Wan Adnan said the competition is part of the state government’s effort to promote sports tourism and so far 150 participants had confirmed their participation including from Singapore, while Pahang would have four participants. “As a popular tourist destination, Cherating need to be promoted and hopefully this event will create another history for the stateevent such as this,” he said. Adnan said the top winners would automatically qualify for the World Endurance Championship 2008, to be held in Lembah Bidong, Terengganu in November this year. competitive trail and ride n' tie. technical riding, plenty of water, and some bog. and had to push their limits to achieve finishing times. Krause and Christine Smith) and some talented veterans. Cathy Kolesar also earned the Individual bronze medal. peaking for this ride. She’s just my little energizer bunny." team alternate riding an Arabian mare named Rosie. and were pursuing a successful ride season leading up to Nationals. was certainly a proud moment." wanted to quit and he wanted to keep going." competition we’ve had, it was just phenomenal. I'm so proud of him." "I was quite honored to be on the team." credits a great deal to. perhaps a glimpse into Smith's future. said I would win." And she did. Marchant rode as an individual and captured the individual gold medal. acknowledged and I still got acknowledged with Sam." The USA squad which will travel to Malaysia to compete for medals at the 2008 World Endurance Championship in Malaysia, November 6-9 will be selected from the following nominated entries. The squad, or Definite Entry list will be submitted to the WEC Organizing committee no later than October 1. Congratulations to the 12 nominated entries. worked hard to try out for the team. Over 50 endurance riders, including some of Australia's best and several international entrants took the opportunity last weekend to ride the endurance course that will become the Tom Quilty Gold Cup National Championship course in September 2009. This preview ride, known as the FEI CEI 3 * provided entrants with a range of ride options depending on their capability level. Options included a 160km ride, referred to as the 3*, 108 km FEI 2* ride and an AERA 108 km Elevator ride. All ride categories were open to both adult and junior riders. Based at the world-class Tonimbuk Equestrian Centre in Bunyip, Victoria the challenging course included six phases, passing through the magnificent Bunyip State Park, traversing private land, bush tracks and all weather roads. Each phase varied in distance with riders required to vet in at base prior to heading off for the next phase. Event Director, Lissy Verity could not have been happier. "We had riders from Tasmania, South Australia, New South Wales and Queensland, all of whom were warmly welcomed by the Victorians," she said. "International riders from Malaysia and guests from New Zealand and the USA also turned up to either participate in the ride or be dazzled by the facilities of the Tonimbuk Equestrian Centre. We also had visitors from the UAE stables." Whilst the weather forecast had been for heavy rain in the preceding week and over the weekend riders were not deterred. Those competing in the 160km 3* ride headed off in the dark at 2 a.m. wearing specially designed torch lights attached to their riding helmets. All other riders started at the more civilised hour of 6 a.m.
What an exciting finish. With a time limit of 17 hours to complete the 3* ride, it was anybody’s race right up to the line with three of Australia's top endurance riders coming in within a second of one another. Open winner, Meg Wade crossed the line in 12:37:12 riding Castlebar Kalahari, closely followed by Penny Toft, riding Electra BBP Murdoch (12:37:13) and in third place was Jennifer Gilbertson on Ferrymaster At Webbs Creek in 12:37:14. As a rider who has successfully represented Australia internationally Meg Wade was delighted with the overall performance of her Castlebar Arabian Endurance Horse team. "It was a safe yet challenging track," said Meg. "We had 10 horses entered in the event and we had 10 finish." Meg and Castlebar Kalahari also took out the Best Conditioned horse award. Rohan Stanes performance really captured the essence and camaraderie of the endurance fraternity. Last to finish following some concerns with his horse, he returned to a standing ovation at 10.30 p.m. on Saturday night having spent nearly 17 hours in the saddle. Fellow competitors, officials, friends and family watched, some even shedding a tear, as Rohan's lovely grey Arab mare Shuja Bint Melika vetted in successfully. 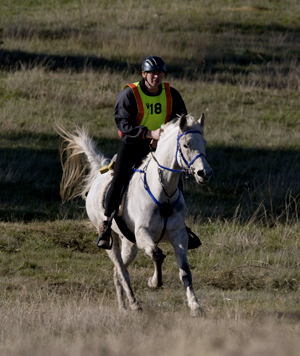 An experienced endurance rider, Rohan said the course was challenging with hills in all phases, and at times the going under foot was slippery. "Given the degree of difficulty of the course all the horses that completed the course did very well," he said. Winner of the FEI 108km 2* Open category was Asher Batty riding Castlebar Dell. Brianna Bainger won the Youth category on Magic Glenn Katana and finishing first in the 3* 160km Youth category was Bridget Nottle riding Zara Farm Shadasj. The AERA Heavyweight winner was Ken Bradley riding Pheonix Park Epona, Middleweight division was won by Louise McCormack on Formosa Park Tali and the Lightweight winner was Natalie Thome riding Zayed Shakahn. The Junior division was won by Zeke Verspaandonk on Tonki Dee Boo Imagine, owned and trained by Ross and Debi Chisholm from Olivesprings. According to Lissy Verity the course has now been tried and tested. "The track held up quite well considering the weather just prior to the event but there were some boggy spots. We have already reviewed the course and identified some areas of concern including traffic management, arena size and movement of spectators," she said. "We now have a much better insight to running the prestigious Tom Quilty Gold Cup National Championships and the 2009 event will be the best yet." The Tom Quilty Gold Cup National Championship is legendary in Australia and internationally recognised as an event that truly tests the skill and strength of horse and rider as they compete to finish the 160km ride within 24 hours. It is one of the few events where riders compete as equals--world champions riding alongside juniors and first time Quilty riders. The event requires riders to negotiate the 50 miles of Rocky Mountain foothills terrain in the fastest time all while being monitored at veterinarian manned checks along the way to ensure their horses' fitness to continue. Getzinger, aboard his twelve year-old Arabian, Prince Charming and teammates, Nancy Haughian of Grande Prairie, AB riding Buckaroo Heart, and Karen Badger of Grande Prairie, AB riding eight year-old Anglo-Arabian Erna Moon claimed the team gold medal and Getzinger was also awarded the Endurance Riders of Alberta individual gold medal. Of twenty-nine starters, twenty crossed the finish line. Getzinger considers himself a recreational competitor, busy raising a family; his first competition was in 1992 in the sport of competitive trail. He was excited to represent Alberta in his first National and first team competition. "I knew I wanted to do well. I wanted to represent well." Says Getzinger. " My horse surprised me - I just sat back and enjoyed scenery. I didn’t feel as strong as my competition.” Says Getzinger who found himself humbled among a talented field. "I just love to ride and love endurance. To come up that well was very satisfying." Getzinger holds the team gold in high esteem. "By far -to win the team gold is more satisfying. When I came into the first check, still running with the leaders, I recall talking to the chef d’ equipe. We discussed staying with the leaders." It was a conscious decision to not run his horse harder than he felt capable to keep up with Karius and two Montana riders. "To stay with them put me and my horse ahead of the team. I felt I would have been pulled and it would have been selfish and would have sacrificed the team. I believe I’m a team player and it was more important than team victories. My horse is my friend - I’m not going to hurt him for anything or anybody." "The scenery, the beauty, the competition. I still think there was nothing about that ride I could complain about." With the opportunity to compete among such a talented field, Getzinger also learned a great deal. It was also the first time someone crewed for him including veteran competitors Christy Janzen and Larry Handziuk who he credited with such great results. (crews are people who help care for the horse and rider when they arrive at checkpoints.) "It was very emotional -any club would rush to us. Taking care of the horse and us." In all, Alberta claimed seven of the nine Canadian Championship medals during four days of competition. Over 170 riders from the United States and Canada took part. The Canadian Nationals take place every two years alternating between eastern and western Canada. The first Nationals were held in Ontario in 1984. Provincial teams are formed with riders nominating to their provincial organization. Eight events took place over five days including International and Canadian National level rides as well as local level rides open to all level riders. Sundre, AB -Elroy Karius of Kelowna, BC and his six year-old equine partner Jolly Holiday "Doc" captured the 50-mile endurance ride at the Rocky Mountain Challenge – 2008 Canadian Nationals August 2, 2008. The endurance ride was one of the eight events hosted over five days of competition which also included the long-distance equine sports of competitive trail riding and ride n' tie. The events were hosted at Red Deer River Ranches south of Sundre, AB. Karius, an active endurance rider since 1994 got his start in competitive trail riding in 1981. In the last 6 years or so, when he broke the 6:30 hour mark, Karius has really become a contender. His fastest 50-mile ride was a flat ride in 3:40. This Nationals trail would not see blistering times to set any speed records. Its challenging terrain saw 1316 meters of elevation gain in long climbs. Technical stretches included some exceedingly difficult bog, which would claim many riders and saw one rider air-lifted to hospital. Twenty of the twenty-nine starters finished the event. Just finishing the ride became an achievement and Karius would claim the gold with a ride time of 5:37:57. "When you do this sport and the horse gives you everything they can give you and you get it done…it’s a gift." Said Karius of his win. Bill Miller of Fairfield, MT rode his Arabian HA Lady Valarrie and captured the silver and the coveted best condition accolade with his time of 5:39:21. Doug Swingley of Lincoln, MT rode JV Laredo, a seven year-old Arabian to the bronze medal finishing in 5:47:31. Karius’s mount 'Doc' claims that the horse has that Doc Holiday attitude. "He was a handful to work with. He’s tested us in many ways and continues to this day." Chuckles Karius. "But he’s probably got the best work ethic than any other horse I’ve ever worked with." "For a young horse, he’s certainly done his work. He was awesome all day." Credits Karius. "For me, there is not greater pleasure than riding a fit horse." Karius credits his wife, Gail Jewell, a veterinarian and fellow competitor who won the 100 mile the following day, his skilled farrier and other BC riders with assisting in achieving the big win and in helping him achieve in his chosen sport. In 2003, Karius was named AERC middleweight division champion in Reno, NV and a week later he did a five day ride and claimed best condition on three of the five days. "That was Huge. I had this horse. It was a gift. He was exceptional." Karius and the top contenders in the ride brought World Class horsemanship and talent to compete and riders of all levels were able to garner new experiences from their presence. The Canadian National Champions included: Alberta team of Nancy Haughian of Grande Prairie, AB riding Buckaroo Heart, Dave Getzinger of Drayton Valley, AB aboard Prince Charming and Karen Badger of Grande Prairie, AB riding eight year-old Anglo-Arabian Erna Moon claimed the gold medal. The Silver medal was awarded to Carol Wadey of Edson, AB and her two young daughters, Rae-Anne (17) and Robyn (13). These talented riders comprised Alberta’s second team and were the only team in both the 50 and 100-mile events to finish all three team members. British Columbia secured the bronze medals with riders Lori Brewza from Chase BC riding her twelve year-old Morab Black Majik, Gail Jewell of Kelowna, BC and Wyatt Laing from Okanagan Center, BC riding a part-bred Arab Cody Flair. The Canadian Nationals are held every two years, alternating between eastern and western Canada. "The ranch was an excellent venue to showcase long distance talent. competitor in the junior 80-mile Competitive Trail event." sports including three gold and two silver. surprise to have the "home team" in the medals," commented Nielsen. tabulated to determine the 2008 Canadian Champions. riding Touch of Steel and Anne MacKay of B.C. riding Dante. together a stellar ride finishing with an individual gold medal. and endurance." beams a self-assured young Brunner. and you get it done…It's a gift." Said Karius of his win. the silver and the coveted best condition accolade with his time of 5:39:21.
bronze medal finishing in 5:47:31.
the World Equestrian Games in Kentucky in 2010. There was no bronze team awarded. Trisha Dowling DVM (St. Denis, SK), Bronze - Crystal Fulcher. and field, cross-country and also did the K-100 relay in Kananaskis country. course in 6:15 riding sixteen year-old Morab, Fort William. GREEN Valley Farm is to become home for more than 100 horses and riders this weekend. 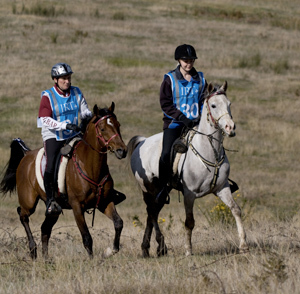 And the Green Valley Tingha Endurance Ride 2008 is set to become an International Endurance event. There will be three riders from Thailand at the Tingha ride including Prutirat Serireongrith, who is the vice-president of the Thai Endurance Riders Association, from Bangkok, Wipawan Pawitayalarp of Bangkok and Dr Supanee Chaiwiro from Pattaya. All three riders will be attempting the 80km ride. Prutirat has previously completed two 40km and two 80km rides in Australia. Both Wipawan and Supanee have completed one 40km ride in Australia, but they have also completed several 40km and 60km rides in Thailand. This will be their first attempt at the 80km distance. Prutirat will be riding his own horse, Shardell Prince Ali, a 6-year-old purebred gelding bred by Rod Strahan of Shardell Arabians in Queensland. Wipawan will be riding another horse owned by Prutirat, Shardell Galazan, also bred by Strahan. Supanee will be riding Mt Eerwah Silver Mariner, an 11-year-old purebred gelding bred by Robyn Pembroke of Mt Eerwah Arabians of Queensland, and owned by Splendacrest Endurance Training. Endurance riding in Thailand is in its infancy, although support and interest in the sport is growing rapidly. By gaining experience in Australia, where endurance riding is well established, these Thai riders are hoping to progress the sport at home. In addition, there will also be His Excellence, Sheik Saeed Bin Maktoum al Maktoum from the United Arab Emirents. He will be riding in the 110km challenge ride, and is keen to win the event. Enduranace racing is a very popular sport in his country, where riders compete for prize money. But in Australia, prize money is not allowed. The captain of the Bahraini royal endurance team Shaikh Nasser Bin Hamad Al Khalifa expressed his great joy on the first European victory of Shaikh Khalid Bin Hamad Al Khalifa, leader of al Khalidiya Stables, at the Thetford race. The victory in the fourth European event for the Royal Team adds to the good days Shaikh Khalid is having after graduating from the Toyal Military Academy Sandhurst, Shaikh Nasser said. The team is preparing for the World Endurance Championship in Malaysia to be held in November. The generous support of Shaikh Mohammed Bin Rashid Al Mmaktoom and his sons Shaikh Hamdan and Shaikh Majed was also a great source of joy, Shaikh Nasser said. Shaikh Khalid repeated his achievement of last year by scoring the fastest time in the 160 kilometre race. Shaikh Khalid praised the level exhibited by Shaikh Khalid in the race and his performance in its six stages. Shaikh Kkhalid deserved the victory which he earned after a putting a lot of efforts for this race, Shaikh Nasser said. On his part, Shaikh Kkhalid extended his appreciation for Shaikh Mohammed Bin Rashid Al Maktoom, Shaikh Hamdan and Shaikh Majed for their great support throughout the event. Shaikh Khalid said the race would be a beautiful memory as it was the first time he won a European Endurance Championship. He said that the guidance of his brother Shaikh Nasser has led him to the finish line of the race. Shaikh Nasser became a main source of support after his withdrawal from the race, he said. Shaikh Duaij Bin Salman Al Khalifa praised the big victory of Shaikh Khalid, especially that the race witnessed strong competition from the very beginning. As a Bahraini Team, we were keen to stay together until the end but circumstances played against us, he said. Shaikh Nasser decided to withdraw, rider Mohammed Abdul Aziz was slightly injured after his horse tripped, he said. Only three were left with Ahmed Abdulla who tried his best but could not complete the race as his horse did not pass the veterinarian checkup, he explained. Shaikh Duaij commended the significant role Shaikh Nasser had in guiding the team during the remaining phases of the highly competitive race. The Thetford race witnessed a steamy competition with the positions of jockeys shifting at every stage. At the second stage of the race, both Shaikh Khalid and Shaikh Duaij crossed the distance in 3.48.28. Mohammed Abdul Aziz completed the distance in 3.51.30 and Ahmed Abdullah in 3.46.29. Shaikh Mohammed Bin Rashid Al Maktoom had the lead with 3.42.06. at the 120 km, Yousif Ali Taher completed the distance 3.41.56 whereas Ghazi Al Dosseri's horse was injured and therefore lost time. In the 120 km for youth, Mohammed Abdulsamad crossed the distance in 3.31.09. After the first stage, Sshaikh Nasser came third with 2.06.42 while Shaikh Mohammed Bin Rashid has the lead with 2.05.37. Ahmed Abdullah came third with 2.06.28 and Shaikh Khalid came fifth. Although Shaikh Mohammed Min Rashid was ahead in the third stage, Shaikh Khalid continued with a time of 5.24.10. Ahmed Abdulla had a time of 5.29.09 and Yousif Taher 4.05.08. the members of the royal team were still present in the fourth stage for 160km and 120km. Shaikh Khalid Bin Hamad had a time of 6.22.27, Ahmed Abdullah with 6.19. 46 and Shaikh Duaij Bin Salman 6.23.13. Mohammed Abdul Samad withdrew at 120 km because he got dehydrated. It is with great pride that we congratulate the following members for completing FAURESMITH. Congratulations to you all and for those who never completed the ride better luck next time.. It was good to see so many members at Dullstroom last weekend. Henno Pretorius and his family, Herbie and Johannie Geldenhuys, Laura Woods, Ance Deetlefs, Dr Paul VanDam and Franza Keyser and Julius Keyser. To my knowledge all our members got through and this is also no mean feat as Dullstroom is a very difficult course. I would also wish to thank the following club members who were so kind as to assist us with donations to obtain finance to assist with the furnishings of the luxury chalets which Mr William Khoury has built at the second dam. The members are, Antony Ball, Kobus Lombaard, Darnie Ferreira, Tim Anderson, Dr Paul VanDam and myself. The new ride base apart from the grassing on the running lanes and vetting area which will take place early in September is looking absolutely superb and this is indeed a ride base which the club and its members can be very proud. Monique and Laura recently returned from Brazil where they attended an international ride and I annex hereto a report from Monique on the ride which people might find of interest. We will advise you shortly of the AGM which must be held before the end of October to enable all fees to be paid in and over to ERASA to avoid penalties. For those club members travelling to Walvisbaai I wish you the best of luck and a safe journey. In 2006 and 2007, Nick and Vitoria Lins of Rio, Brasil, came to South Africa to join us at the FEI Christiana Endurance Ride on horses prepared by Laura Woods (2007) and Laura and the Marx family of Wolmaranstad in 2008. Both Nick and Vitoria have been selected for the Brasilian team to take part in the World Championships in Malaysia in 2008. Nick recently rode with South African Carmen du Preez in Brasil: Carmen won the open 160kms event, and Nick’s efforts gained him the Brasilian Championship. A return invitation was issued to Laura Woods and Petrus Marx as Young Riders to take part in the prestigious Festival Internacional de Enduro: Jequitibá (Sao Paulo, Brasil) on 25 July 2008. 33 Young Riders from Brasil, Argentina, Chile, Uruguay, France, Italy and England and South Africa took part. The ride base was the exclusive Paradiso Resort, where spectators could watch the final leg being run around a fountain–filled lake. The CEIOYR course of 122kms consisted of three extremely technical legs, with steep hills and hard roads, estimated at about a 10 handicap. The last two legs of 22 and 19kms were flat, fast and furious. The horse ridden by Laura, NNL Millenium Bay, was recovering from a tendon injury and unfortunately despite a valiant effort could not get past the 4th leg. Petrus rode Lumiar Simply Red, a fiery chestnut mare owned by Dr Paolo and Nick Lins. She has spent most of her 10 years as a show horse, only last year coming into endurance and with a mere 2 x 60kms and 1 x 90kms to her name. This was her first attempt at 120kms. She gave Petrus a hard time in the 1st leg, being most unwilling to be held in. After the 3rd leg Petrus decided to ride without a bit due to mouth injuries and the mare calmed down somewhat. Petrus was in the top ten from the first leg. The mare kept up her desire to run as fast as possible, and on the final two legs she and Petrus perfected their partnership. As Petrus approached the last 500m he passed two well known riders, Rafael Salvador (Uru) and Iuri Timoner (Bra) who then dramatically gave chase as they came in to full spectators’ view around the lake. Petrus casually turned around to see them coming in full flight, and he then turned on the power. To an exultant rendition of “Hier kom die Bokke” by the South African fans, Simply Red curled her tail over her back and leapt forward to sweep over the finishing line, giving Petrus 5th position in a time of 6h55. He was one of 23 who completed the course; 12 were eliminated. This was Petrus’ first ride out of Africa. You may remember him in a documentary of Fauresmith made by Danie Ferreira (Urban Brew) in 2003. He was the little chap with big eyes captured in the early morning light; the commentator talked about his desire to become a Springbok – which in fact came true. Petrus’ first horse was a Schneider; he qualified him in his first season and finished in the top ten children’s division at Fauresmith in 2003. Since then he has ridden for the national team on 3 occasions. His Arab gelding Shamalti Namib has been awarded Best Condition on 3 occasions. BAHRAIN'S Royal Endurance Team rider Shaikh Khalid bin Hamad Al Khalifa won the 160-kilometre event of the Thetford race, held yesterday in England. It was the first European endurance victory for Shaikh Khalid, who is fast improving as one of the kingdom's best riders. The Bahrain Royal Equestrian and Endurance Federation (Breef) first vice-president completed the distance in a dominant eight hours 19 minutes and 12 seconds, which was more than half an hour than his closest rival. It was also a close mark to the winning time of Royal Team leader and Breef president Shaikh Nasser bin Hamad Al Khalifa in Thetford last year. Shaikh Khalid was congratulated for his victory by Dubai Ruler Shaikh Mohammed bin Rashid Al Maktoum, and Shaikh Nasser. Both Sheikh Mohammed and Shaikh Nasser withdrew from the race in the second stage due to an injury to their respective horses. Shaikh Khalid said that he dedicates his hard-earned win to His Majesty the King. Finishing second in the 160km event was Royal Team member Shaikh Daij bin Salman Al Khalifa, who clocked a time of 8:56:24, while Shaikh Majid bin Mohammed bin Rashid Al Maktoum of the UAE placed third in 9:31:21. Meanwhile, Bahrainis Yousef Taher and Ghazi Al Dossary finished sixth and eight respectively in the 120km race at Thetford. Taher had a mark of 7:00:54, while Al Dossary came in in 7:19:37. Mohammed Ahmed Al Subose of the UAE won in 5:20:35. BAHRAIN'S Royal Endurance Team, led by Shaikh Nasser bin Hamad Al Khalifa and Shaikh Khalid bin Hamad Al Khalifa, will be taking part in the Thetford Endurance Race in the UK tomorrow. The event, which will feature races over 160 kilometres and 120km, is part of the Royal team's preparations for the International Federation of Equestrian Sports (FEI) World Endurance Championship, which is scheduled to take place in Terengganu, Malaysia in November later this year. Both Shaikh Nasser and Shaikh Khalid will be competing in the 160-km event, along with Shaikh Daej bin Salman Al Khalifa, Mohammed Abdulaziz, Ahmed Abdulla and Yousef Taher. Meanwhile, the Bahrainis taking part in the 120km race will be Mohammed Abdulsamad, Ghazi Al Dossary, and Jordan Galas. Shaikh Nasser, the Bahrain Royal Equestrian and Endurance Federation (Breef) president, said that tomorrow's race will be the Royal team's final event prior to the world championships. Shaikh Nasser also decided to compete in the 160km race with the main Royal team members, who will participate in the Malaysian event. The race will be the second endurance meet being participated by the Royal team in Thetford. Last month, the team took part in a similar competition, with five of its top riders finishing among the top 10 in each of the categories. Shaikh Nasser and Shaikh Khalid took part in the 120km race then, along with Shaikh Daej. Shaikh Khalid completed the race sixth overall, while Shaikh Nasser came in ninth and Shaikh Daej 10th. Abdulaziz, on the other hand, came fourth in the 160km race, while Taher was fifth. The medical check for tomorrow's race will take place this afternoon, to be held under the supervision of the FEI. The motto of Australian endurance riders is "To complete is to win". 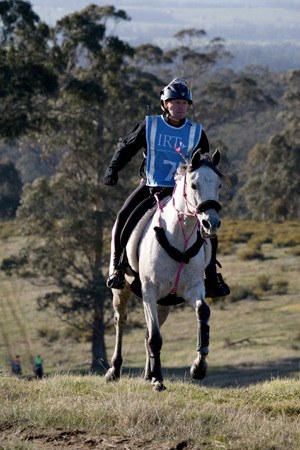 In excess of 70 riders from around Australia and the globe will be aiming to complete the FEI CEI 3* 160km , FEI 2* 108km and AERA 108km elevated ride endurance ride this weekend (8-9 August) at Tonimbuk, Victoria. Considered a world-class endurance ride, it is a preview event to the internationally renowned Tom Quilty Gold Cup scheduled for September 2009 as it covers the exact same course as the Quilty. This FEI ride will also be used as a qualifying event for the 2009 Malaysian World Endurance Championships. Based out of the Tonimbuk Equestrian Centre, an internationally recognised equestrian facility, the ride will pass through the magnificent Bunyip State Park, traverse private land, bush tracks and all weather sandy gravel roads. The 160 km ride commences at 2 a.m. on Saturday morning with horse and rider combinations returning to the Tonimbuk Equestrian Centre to vet in after each phase has been completed. The weekend of the 17th-20th of July was a busy date for the Kuźnia Nowowiejska Equestrian Center (near Zyrardow), as the club held competitions in endurance racing: the Polish National Championships for Young Riders and Juniors, an international competition and an All-Polish competition in this discipline. Altogether nearly 40 pairs from Poland, Czech Republic, Lithuania and Sweden competed in 7 contests. On Friday the domestic contests were held. Victorious over the shortest distance - 30 km (L rank) - was a competitor from the Champion Lodz Equestrian Club, Katarzyna Nykielewicz atop the stallion Elpas 2002 (Arzgir - Elema by Wermut), bred by Tarus Arabians. In the P ranked event (50 km) triumphed Olga Ciesielska with Peoria 2002 (Balon – Peseta by Eldon), bred by Janow Podlaski Stud., also under the flag of the Champion Equestrian Club. Apart from the distances where style mattered, also held that day was a racing contest ranked 1* over 70 km. Unfortunately, none of the five pairs who competed managed to finish this distance - all horses were eliminated due to lameness. In part this could've been a result of the going of the course, which (as far as Polish conditions go) was hard and required particular attention from the riders.